A 58-year-old woman with a medical history significant for previously undiagnosed right breast mass of 18 months arrived at the emergency department following four to five weeks of blurry vision, facial pressure, and fatigue. The physical exam and nasal endoscopy were unremarkable. Imaging, which included CT brain, MRI brain, and CT sinuses, demonstrated hyperdense soft-tissue opacification of the right frontal, sphenoid sinuses, and ethmoidal air cells with corresponding decreased T2 signal and osseous erosive changes involving medial orbital wall with soft tissue extending to the orbital apex. Diffuse pachymeningeal enhancement involving the dura was noted, including asymmetric enhancement of the right cavernous sinus. Differential diagnosis included sinonasal metastatic disease or fungal sinusitis. After consultation with neuroradiology, the patient was transferred to a tertiary care center for surgical evaluation and debridement, which revealed adenocarcinoma of the sinuses. A CT scan of the brain exhibited mucosal thickening in the maxillary sinuses and complete opacification of the frontal sinuses and right ethmoid sinuses. 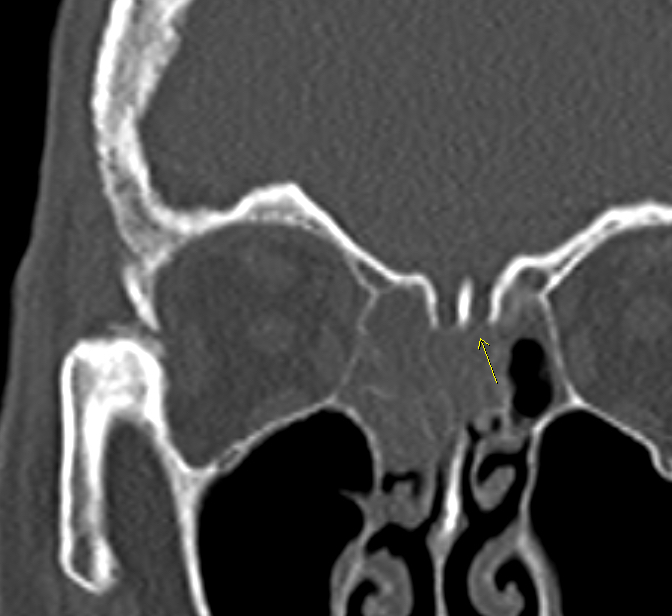 Walls of the right ethmoid sinuses appeared thin. Mucosal thickening of the left ethmoid sinuses as well as complete opacification of the right sphenoid sinus were noted. There was right mastoid air cells opacification and partial opacification of the left sphenoid sinus. 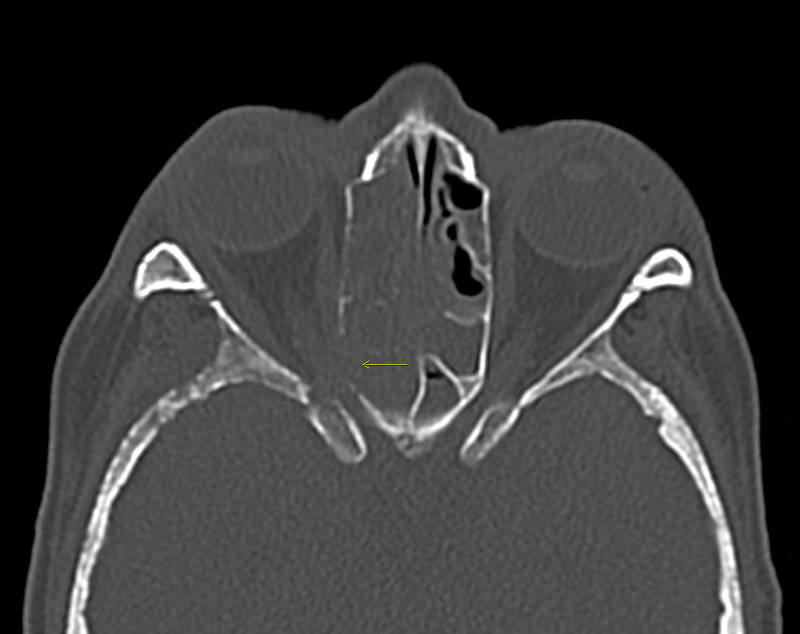 A CT scan of the sinuses without contrast revealed hyperdense soft tissue opacifying the right sphenoid sinus extending to the right posterior ethmoidal air cells with osseous erosive changes; erosion of the right anterior wall of the sphenoid sinus, posterior right ethmoidal air cell septi; and mild erosion of the posterior medial walls of the maxillary sinus and medial wall of the orbit with minimal soft tissue extending to the orbital apex. Erosion of the left cribriform plate was noted. Further, there was opacification of the right mastoid air cells, left sphenoid sinus and bilateral frontal sinuses. An MRI scan of the brain with and without contrast revealed mucosal thickening and fluid throughout the paranasal sinuses. The thickening extensively involved the right mastoid air cells, bilateral sphenoid sinuses, and frontal sinuses. Additionally, osseous destructive change and associated low T2 signal soft tissue involving the right anterior sphenoid sinus and adjacent ethmoidal septa was noted. The radiographic appearance of this case suggests one of two diagnoses: acute invasive fungal sinusitis with skull base and orbital erosion and dural involvement, or dural metastasis with sinus invasion. Both can present with hyperdense soft tissue in the sinuses with corresponding decreased T2 signal and osseous erosive change. The exact diagnosis requires correlation with clinical presentation and laboratory values specifically correlation with neutrophil count. 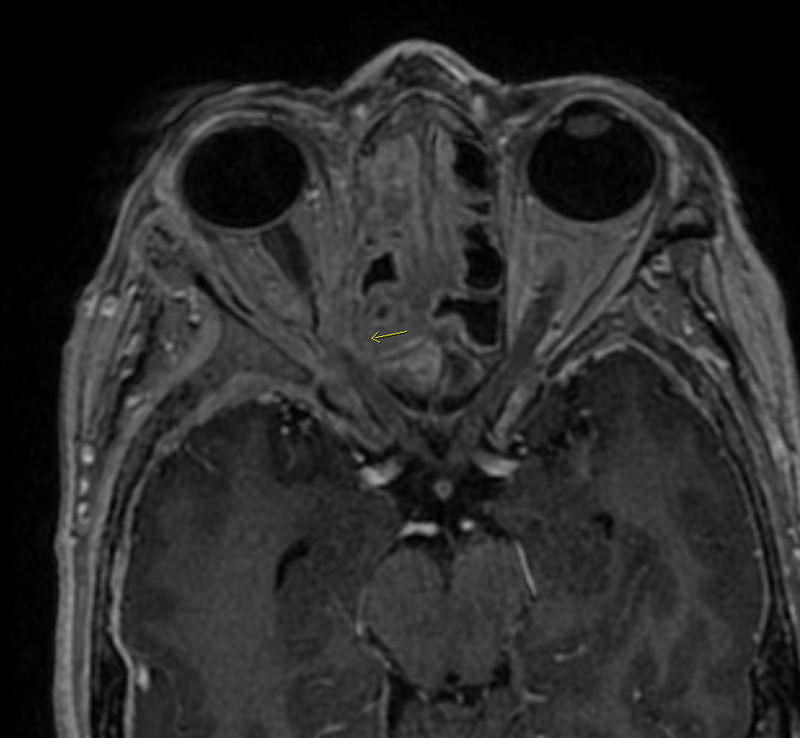 Metastatic disease to the sinuses and orbit is rare, making this case unique both from an imaging study and differential diagnostic standpoint. The patient did have a suspicious, untreated right breast lesion upon presentation and surgical pathology indicated it was consistent with carcinoma with possible metastatic disease. These findings raised the suspicion that the current, presenting chief complaints of four to five weeks of blurry vision, facial pressure, and fatigue could be related to the patient’s breast lesion. This is where imaging can be helpful. Computed tomography a common diagnostic modality for evaluating invasive sinusitis and metastatic disease, as it allows for well-defined visualization of the osseous anatomy. High-resolution facial bone CT is best at demonstrating bony erosion and expansion of the infection. MRI imaging is required to further refine the differential, as was done with this patient. Hyperdense soft tissue opacification as well as decreased T2 weighted signal observed on the imaging studies is characteristic of fungal sinusitis. Given the extensive nature of this patient’s sinonasal symptoms, combined with the osseous erosions seen on CT and the decreased signal noted on T2-weighted MRI, consultation between neuroradiology and otolaryngology resulted in the patient’s transfer to a tertiary care facility for urgent surgical evaluation and debridement. Surgical pathology at the tertiary care center revealed metastatic sinonasal and right orbital adenocarcinoma secondary to the patient’s right breast lesion. 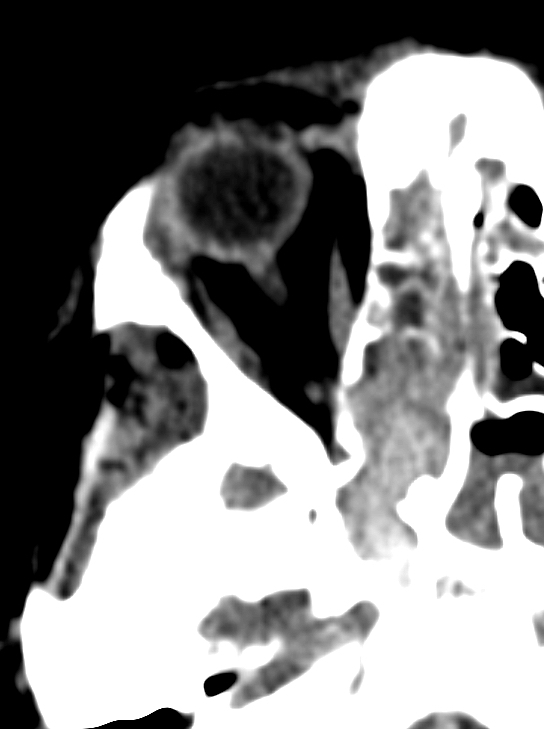 From a radiological perspective, this diagnosis poses an interesting challenge as findings represented metastatic disease mimicking what appeared to be acute invasive fungal sinusitis. In addition to metastatic disease, acute invasive fungal sinusitis is an important clinical problem that should be considered when constructing a differential diagnosis for the immunocompromised patient, such as a patient with cancer. Acute invasive sinusitis typically develops over a few weeks and can demonstrate hyphal invasion of blood vessels.1 Common causes of immunosuppression that can result in fungal sinusitis include: malignancies, neutropenia following chemotherapy, diabetes mellitus, and glucocorticoid use.2 Acute, invasive infections infections are usually due to Aspergillus species, Fusarium species, and Mucorales.3 Fungal sinusitis typically involves multiple sinuses with the most common being the ethmoid and maxillary sinuses.3 If suspecting fungal sinusitis, consult an otolaryngologist for nasal endoscopic evaluation. Typically, patients with fungal sinusitis will demonstrate necrotic lesions on their nasal septum during physical exam. Our patient failed to demonstrate these physical exam findings, so despite imaging studies suggestive of a fungal pathogen, invasive fungal sinusitis became a less likely diagnosis. Finally, another useful tool to consider when using imaging studies to determine whether a patient with an underlying malignancy has fungal sinusitis versus metastatic disease is the patient’s absolute neutrophil count.4 Patients with an absolute neutrophil count <500/microliter are more likely to have a diagnosis of acute invasive fungal sinusitis.5 The patient’s absolute neutrophil count was documented well above 500, making fungal sinusitis less likely. Chakrabarti A, Denning DW, Ferguson BJ, et al. Fungal rhinosinusitis: a categorization and definitional schema addressing current controversies. Laryngoscope. 2009; 119:1809.
deShazo RD, Chapin K, Swain RE. Fungal sinusitis. N Engl J Med. 1997; 337:254. Cox GM, Perfect JR. Fungal rhinosinusitis. UpToDate. https://www-uptodate-com/contents/fungal-rhinosinusitis. Published January 2018. Accessed February 20, 2018. DelGaudio JM, Clemson LA. An early detection protocol for invasive fungal sinusitis in neutropenic patients successfully reduces extent of disease at presentation and long term morbidity. Laryngoscope. 2009; 119:180. Payne SJ, Mitzner R, Kuchala S, Roland L, McGinn JD. Acute invasive fungal rhinosinusitis: A 15-year experience with 41 patients. Otolaryngol Head Neck Surg. 2016;154(4):759-764. Nemoy MP, Aftab M. Metastatic sinonasal and right orbital adenocarcinoma secondary to right breast lesion. Appl Radiol. 2019;48(2):32-33. Prepared by Mr. Nemoy while a fourth-year medical student at the Kirksville College of Osteopathic Medicine, and doing his clinical rotations at Ascension Genesys Hospital, Grand Blanc, MI; and Dr. Aftab while serving as section chief of neuroradiology at Ascension Genesys Hospital in Grand Blanc, MI.